What a shock to open a book and discover you’ve already read it. 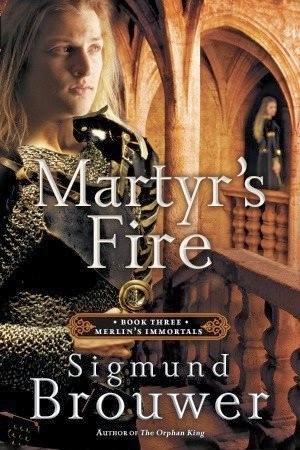 This was surprisingly the case with Martyr’s Fire by Sigmund Brouwer, part of the Merlin’s Immortals series. This is Waterbrook Multnomah’s attempt to republish the very obscure Wings of an Angel series that was released in the early 90s. I found the series and enjoyed it some years ago, so upon finding that this book was part of the same series, albeit renamed, I was delighted. This is in a series, so I recommend starting at book 1. I only received this as a review copy, not expecting it to be part of a series, nor expecting to already be familiar with the story and the series overall. All of the books have been renamed, shuffled, and rejigged, so that this book doesn’t exactly correspond to the ‘old’ book 3. I was happy to find out that these obscure books are being published, with much better cover design and interior. The old book covers were printed in puke-colored shades and the books themselves were so small as to be difficult to read. The new editions are much better. Since it’s been years since I’ve cracked these books, my memory was dusty. Thankfully, everything is just as I remember it — and my memory was faulty enough to still produce surprises and even remember some plot twists. Thomas and Katherine are as delightful as they were when I first opened the book in high school, mixed in with medieval English places, Merlin and magic, and a nice dusting of Robin Hood. The story is largely the same as before. Thomas is battling the Druid priests who have exiled him from his reclaimed island kingdom, Magnus. He discovers the origin of the priests’ power, finding himself in an ancient battle between Merlin’s Immortals and the evil Druids. The source of his answers, and the only place where he may yet be safe, is the holy land. Thomas is followed by Hawkwood and Katherine — friends who helped him in the past, but have lost his trust in the present. As time winds on, answers continue to elude Thomas, and it becomes ever less likely for Thomas to reclaim his kingdom and defeat the Druids forever. There’s my attempt at a back-cover blurb. Good thing I don’t write those. Suffice it to say, the story is as good as ever. This book does suffer from much lower stakes than the previous books: after Thomas’ loss of Magnus and his adventuring escape, the book shifts gears to setup for following books. The conflict in the second half is largely personal — definitely interesting, especially after becoming attached to the characters after the first books — but less exciting than horseback chases and battles. The book does opt for lower stakes, coupled with some information-dumping in preparation for the following books. It’s medieval England with swords and magic — what’s not to love? The quality of the writing is fair. I definitely noticed it a lot more reading through it in college than in high-school. But it’s definitely good enough. Though the dialogue can be choppy, and the internal thoughts plain distracting, the book flows very nicely, and it’s such a good story that it almost makes the writing better. Junior or senior high readers would love this — even re-reading this story after so many years had me pleasantly surprised and turning the pages quickly to find out what happens next. This is a great, all-around fun fantasy book, and you’re missing out if you pass on it. 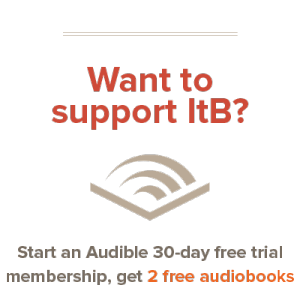 Learn more about the author. I received this book for free from Blogging for Books in exchange for this review.